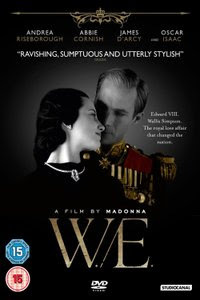 We were pleasantly surprised by Madonna's latest directorial effort, 'W.E.'. Certainly, its critical mauling seems at least slightly unfair to us, and subject to an inherent bias against the popstar. But our latest competition will let you judge for yourselves, as you can enter below for a chance to win one of three copies of 'W.E.' on DVD. The follow up to Madonna's 2008 directorial debut 'Filth And Wisdom', 'W.E.' follows the intertwining tales of Wallis Simpson (Andrea Riseborough) and Wally Winthrop (Abbie Cornish), whose turbulent love lives parallel one another decades apart. It is an unusual take on the story of Simpson and her scandalous romance with King Edward VIII, which was briefly highlighted in 'The King's Speech' last year. HOW TO ENTER: We have two ways of winning one of the three copies of 'W.E.' available in this competition. Firstly, you can email your name and full address (simply so we can send the prize out to you) with Competition in the subject/title to fgcompetition-we@yahoo.co.uk. Alternatively (or additionally), you can "like" us on facebook.com/fadedglamour and follow the instructions via this link. 'W.E.' is available to purchase on DVD at amazon.co.uk.